As a result of changed quarantine regulations, tomato seed is now required to pass testing for several viroid dieases to be imported. The cost of this test in Australia is $3,500 and is prohibitive. 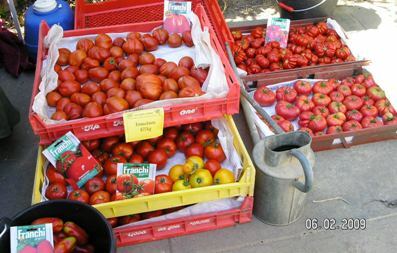 I have included a range of Australian grown tomato seed including many with Italian heritage. A native of America, the tomato (pomodoro) is grown and consumed worldwide and forms a key ingredient in many dishes both raw and cooked. Italian heirloom tomatoes reflect their end use with large salad varieties, and those with plum shaped fruits better suited to making puree (passata) and drying. No other vegetable is as versatile, and it is without doubt one of the most important ingredients in Italian cooking. The term "determinate" is used to indicate that the plant stops growing when its terminal flower cluster develops. Often called bush tomatoes. "Indeterminate" are those that just keep on growing until they are killed by frost or some other external agent. They are most commonly staked and pruned.